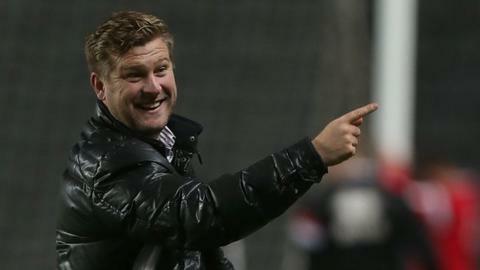 Karl Robinson guided MK Dons to promotion from League One last season. MK Dons boss Karl Robinson says his side's reaction to beating Charlton was like a scene from a war film. Dean Bowditch scored the only goal as Dons moved four points clear of the bottom three in the Championship. "When the full-time whistle went, it was almost like a scene from Platoon. Everyone just hit the ground," Robinson told BBC Three Counties Radio. "I always say to the players don't leave anything on the field and they almost left their bodies on it." Robinson's Dons are playing in the second tier of English football for the first time in their history following promotion from League One, last season. But victory over the managerless Addicks at Stadium:MK on Tuesday night was just their second league win in 10 games. The Dons face a trip to third placed Brighton & Hove Albion on Saturday. "It's important we keep our distance from it [the relegation zone] for the time being," added Robinson.